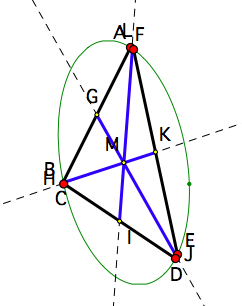 If the midpoints of the opposite sides of a hexagon with opposite sides parallel are connected, then the three lines are concurrent at the centre of the conic circumscribed around the original hexagon. 1) Drag A, B, C, D or E - also check when ABCDEF becomes a crossed hexagon. 2) Can you explain why (prove) the above result is true? 3) Drag the vertices in pairs so that B and C, D and E, and A and F coincide, so that ABCDEF becomes a triangle (a degenerate hexagon). As shown below, this shows that the concurrency of the medians of a triangle is merely a special case of this more general theorem. 4) Download an article of mine from the Mathematical Gazette (2006) for a proof of the result above from More on Hexagons with Opposite Sides Parallel. Copyright © 2016 KCP Technologies, a McGraw-Hill Education Company. All rights reserved. Created by Michael de Villiers, 6 June 2009 with Cinderella; modified 9 June 2017 with WebSketchpad.